1.Perfect for your beautiful kitchen appliances shine with updated kitchen lighting. 2.Perfect for dining room lighting to add warmth and atmosphere to your family's meals. 3.Perfect for living room to give an instant contemporary feel to your loved ones and guests. 4.Perfect for bedroom/bar/Pathway/Garden... etc,you'll find that this seemingly small. change has a huge impact on the space. be mounted is properly attached to a structural member of the building. and allow it to cool prior to replacing light bulb. materials away from lit bulb. 1.Wipe clean using a soft, dry cloth or static duster. 2.Avoid using harsh chemicals and abrasives as they may damage the finish. 3.Do not exceed specified wattage. 4.Please keep in mind that none of the lighting products that we sell include light bulbs. If not , please contact us , we will offer you a best solution. 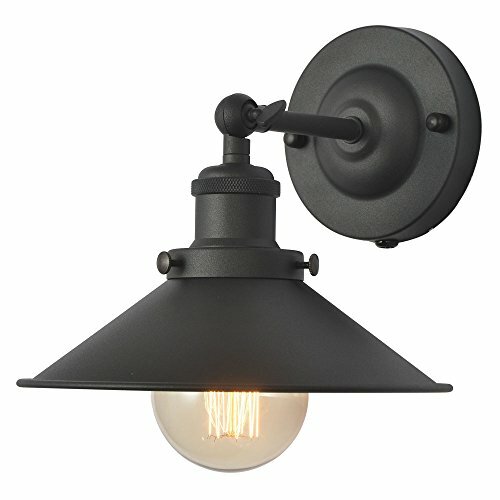 Aged steel Wall Sconce Lighting,Fine workmanship,High quality baking paint with longer service life. Vintage style lamp bring a strong modern industrial look to any light bulb, giving your room a really fresh urban feel. 8.66in of lampshade and adjustable lamp arm are suitable for more scenes, Wall Sconces Light combines modern and vintage style which makes it a perfect decor for your bedroom, living room, corridor, coffee shop, office, etc, suitable for tasteful you. Voltage: 110V-265V,E26 base,Suitable Space 10-15 square meter,Within the safe range of electricity,need not worry about the occurrence of security incidents. View More In Wall Lamps & Sconces. If you have any questions about this product by XIDING, contact us by completing and submitting the form below. If you are looking for a specif part number, please include it with your message.